Mine has being superb. I have a stack of books waiting for me and one of the is already of the list. I found it in a trip to the library I did the day before yesterday. There is a gigantic section with Nora Roberts’s books and I for one could not stop myself. I got this one: ANGELS FALL and Devine Evil as well as something else and Equally as good. The Witching Hour by Anne Rice -These I will reviews as well as fast as I read them, so probably next week. I already know that The Witching Hour is good, how ever I wanted to go back to it to finish the series since I now have access to it- so it will be a very good rest of the week indeed. These book had some of the same elements as the one I read last week from her, The Collector. But they are not at all the same book in the least. I love the mystery of the book. Not only of the story, but of the protagonist. I felt for her. Laughed when she did. Saw what she saw and why she wanted to stay. 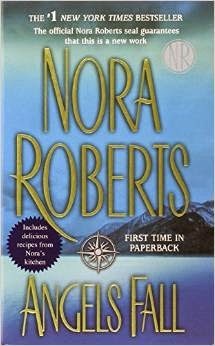 Nora Roberts is excellent at painting a picture, after her books I no longer thing that descriptions are boring and fill out chapters. She uses those descriptions amazingly, puts you right where she wants you to be, when she wants to. I found myself exited and afraid at the same time when those last pages were near and the end is almost upon me, because I know this is when it all goes down. They know who the culpable will be, and there is going to be an event that will decide everyones life… and looked back and forward in the end of the book for more when The End was there. I wish I had more of the book, but then again that is just me, always want more of the Happy Ending of the book when it ends. It was an excellent book and it had me glued to it from beginning to end. I literally read it in one day, all 439 pages of it. I recommend this book. Not only for people who want to read a good romance but for those who like mysteries, small towns, small town gossip and those very refreshing characters that come with that type of life. Not to mention the murder and very carefully planed cover up. I loved being able to guess- and be right about it- who was the murderer. While Reece and Brody helped me with the why’s. Over all, Angels Fall hit all my Great Book marks spot on. I go ahead now and set out “Divine Evil”, no doubt another book I will enjoy. I trust Nora’s writing now :), Two for Two is a great average so far. I hope y’all also have a great book, and I will be posting the audio review of both The Collector and Angels Fall in the Spreaker I Geek Books Audioblog soon. PS: I just found out this book is also a Movie! Posted on May 11, 2015 May 11, 2015 by ccalvarez90Posted in UncategorizedTagged #GreatAuthor, #GreatBook, #IGeekBooksBlog, #IGeekBooksReviews, #NoraRoberts. Previous Previous post: Review of The Collector By Nora Roberts. Spoiler Alert.